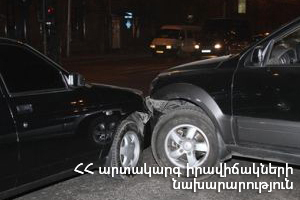 On April 12, at 00:22 an emergency call was received to “911” service that a car accident had occurred in Avangard 5th district of Goris, Syunik province: 2 cars had collided, there was a gas leak, the rescuers’ help was needed. It turned out that “Mercedes-Benz C” car (driver A. B. born in 1992) had run off the roadway and crashed into a parked “Mitsubishi Pajero iO” (driver N. T. born in 1984). Before the rescuers arrived at the scene the driver and passenger (V. A. born in 1993) of “Mercedes-Benz C” car had been taken to the medical center of Goris town. According to doctors the casualties were in fair condition.